Quattro, the Swiss Army Knife of Plotter-Cutters. The Aeronaut Elektron Quattro is a brilliant industrial-strength plotter-cutter of amazing versatility. Designed to be future-proof, the Elektron Quattro has many unique features, carrying on from the tradition of other landmark Aeronaut machines. The Elektron Quattro can carry up to four steered tools. All machines are fitted with a marker and laser pointer holder. The Aeronaut Elektron Quattro is a brilliant industrial-strength plotter-cutter of amazing versatility. Designed to be future-proof, the Elektron Quattro has many unique features, carrying on from the tradition of other landmark Aeronaut machines. The Elektron Quattro can carry up to four steered tools so a machine can be configured to suit the specific needs of your work. You can order a machine with two or three steered tools, and if your needs change, easily upgrade on-site to the full four. All machines are fitted with a marker for marking pattern numbers and a laser pointer holder for digitising, alignment and pattern matching. The Elektron B2 combines the accuracy of the Elektron chassis with quick change bayonet mount tool holders. 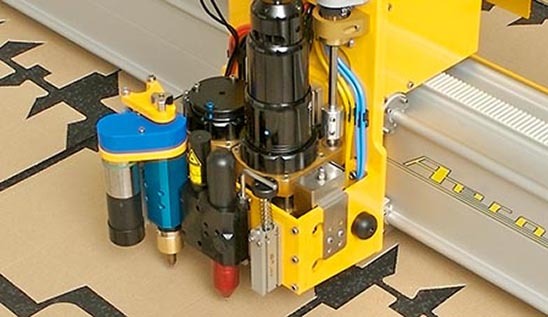 The Elektro B2 is the machine of choice for work such as corrugated box making where reciprocating blade cutters are required and for customers with existing Aeronaut bayonet tools. The Aeronaut Elektron B2 is a brilliantly versatile heavy-duty plotter cutter which combines the accuracy and reliabilty of the Elektron chassis with the versatility and industrial strength of Aeronaut’s well proven bayonet-mount quick change tooling. 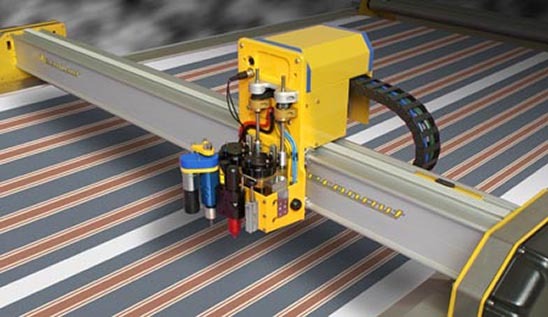 Aeronaut introduced bayonet-mount quick change tools to plotter cutters in the mid-90’s. Tools can be changed in 10 seconds with complete indexing of tool centring, angle and height. The toolholders lock in as easily and quickly as the lens on a 35mm SLR camera. You can quickly fit a wide range of tools for a multitude of job specific tasks the future demands. Use a rotary blade cutter for fast cuts and a tangential knife for details Fit a creasing tool for setting fold lines. You can change blades in no time without fiddling about under the cutter head as you do on conventional plotter-cutters. 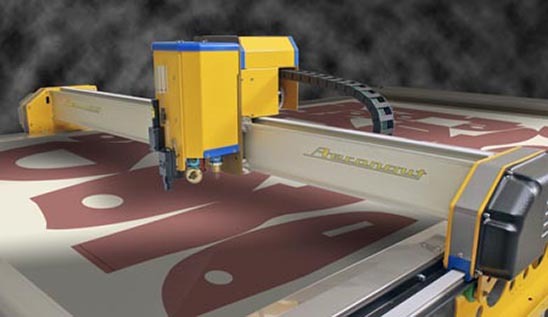 The large bore steered toolholders allow powered tools such as reciprocating blade cutters to be carried meaning the Elektron B2 can be used for applications where thick and difficult materials have to be cut such as corrugated cardboard, box making, composites, rubber, cork and filter materials. Copyright © Automated Cutting Room Services Limited.